Personally, I love our own Visayan style version of kinilaw, with some coconut milk. It’s perhaps what I am most used to, and thus I may be biased, but put head to head against a lime-based seviche, here were some observations. 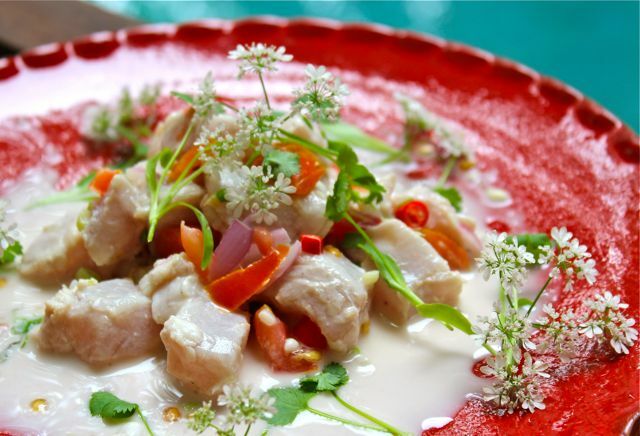 The pinoy style kinilaw had more layers of flavor, from the good coconut vinegar, the coconut milk and the slivers of ginger. Also, I preferred the mere seconds of marination, to the long slow cooking in lime juice — this resulted in a supple, fresh almost sashimi quality to the fish, rather than rubbery cooked chunks of fish. I have made kinilaw several times before, and you may refer to this recipe, or this version if you wish to make this dish at home. 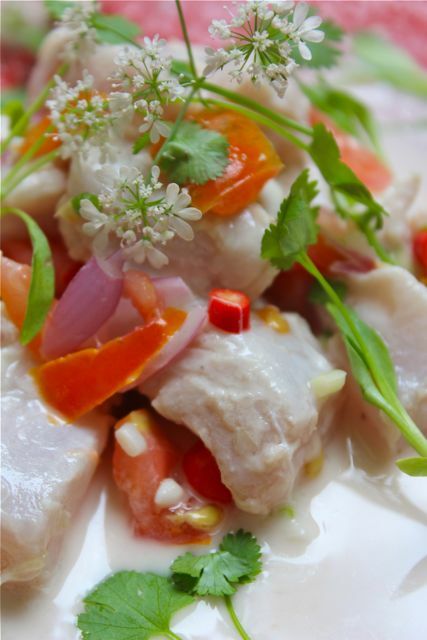 Before you attempt your kinilaw, make sure you have AMAZINGLY FRESH fish, in this case, a newly caught then filleted tanguigue or Spanish mackerel. Use the best locally made vinegar possible, and squeeze your coconut milk together with the vinegar. Marinate your ginger and onions for a few minutes longer in the dressing, before adding the fish, tomatoes, etc. And if you access to these spectacular cilantro flowers, you can experiment with over-the-top garnishes like the ones in the plating in these photos. Frankly, the garnishing did little for the dish, but it was just nice to have cilantro microgreens AND flowers to jazz up the dish. MM – such beautiful pictures! I am so drooling right now…. I tasted in Davao the most delicious kinilaw I ever tasted. Sarap. Yup, your kinilaw with pickled ginger is truly the best, MM! Made it several times with sashimi grade tuna. I know your affinity towards salts. If you have BAMBOO JADE sea salt, a very light dust over the kinilaw brings it to another level! The salt has this aroma that is hard to describe and with a sweet-ish undertone. Hubby went to Maui last year and came across this salt. For those wishing to try it, maybe try Mienhardt’s or Leslie Stowe’s…not sure if Galloway’s has it. But will certainly ask hubby to bring back more when he goes to Maui next time. Will give you shout, Mrs. P and others! my dad used to call well-done steaks as “tapa” or beef jerky, and when kinilaw is over-marinated, my husband calls it “paksiw” already, not kinilaw anymore. And MM, don’t forget sinugba (grilled) among the most important Pinoy dishes. kinilaw and sinugba both call for the freshest ingredients. love the plate…that would have been perfect for the ceviche…looks mexican. Personally love kinilaw combined with sinugba (sinuglaw). 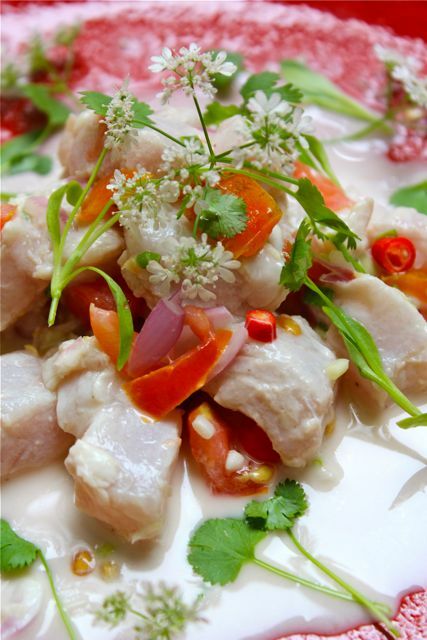 The raw sweetness of the fish and the smokiness of the pork is a really delicious combination. Lucky to live in a place where freshly caught fish is easily available! can’t vote, wala kasi sa option yung resto only. But i have a love hate relationship with kinilaw. I love sugba kilaw. I am currently in a landlocked country dependent on an erratic food supply and the closest thing to a kinilaw is when there’s smoked salmon which I turn to an almost kinilaw with whatever is at hand. Last night’s dinner was breaded shrimp. The moment the server heaped generous amounts of it on my plate, I knew I was up for something horrible. It was the worst over-breaded shrimp disaster. I would think that most of the people who didn’t like kinilaw were served mediocre versions. Hi, MM – My late father in-law was from Bohol and he used to warm the coconut milk for his version of kinilaw – maybe because his very young grandchildren were still learning to eat them and it was his way of covering up the raw fish, but they were really lami. Your photos are mouth watering. Good job, MM and thank you. possitively drooling here! and just after my fish and fries…omg! ….gimingaw naku sa kinilaw with tabon-tabon! I found this great recipe for Paella online, but since it was written by a Spaniard – measurements were in the Metric system but here in the US we use the imperial system – Found this app on the Apple App Store “My Pinche” for only $1.99. It not only helped me convert units, the recipe scaler feature was great. The recipe was for 20, but I cooked for 10 guests – Nice! I did not have to eat Paella for an entire week after the party. Plus the app also has an ingredient dictionary. I wasn’t sure how to buy the Azafran, but learned that in English it’s called Saffron, so when buying the ingredients I sounded as if I really knew my ingredients! Kinilaw and/or kilawin, i was told, add more years to your ordinary life and more zest as well. Imagine the enzymes and nutrition packed in unheated edible plate! Kinilaw na may gata, yan ang laging pulutan sa amin sa Borongan.